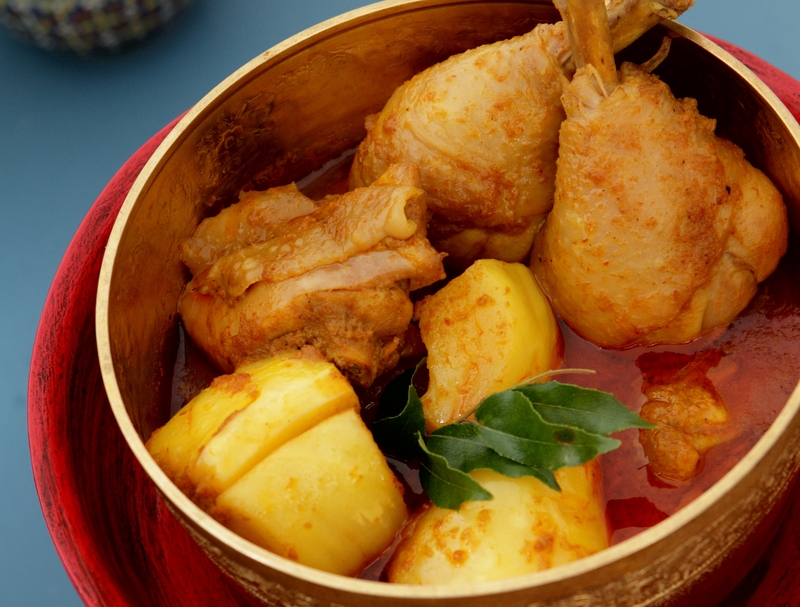 This dish is an interesting combination of chicken and Durian curry. The Durian will have the texture of cooked potato when done. Pound coriander and cumin seeds thoroughly with a mortar and pestle. Add the shallots, garlic, chillies, ginger, galangal, lemongrass and salt, and continue pounding till fine. Add the shrimp paste and curry powder and pound again to a fine paste. Place 120ml of coconut milk into a pot over medium heat and add the curry paste. Sauté until fragrant and oil separates. Add chicken, stir well and continue to cook for a few minutes. Add the rest of the coconut milk and allow to boil. Season with palm sugar, salt and fish sauce, then stir in the durian. Turn the heat to low and allow to simmer for about 10 to 15 minutes. The durian will have the texture of cooked potato when done. Stir in the curry leaves, then remove from heat.